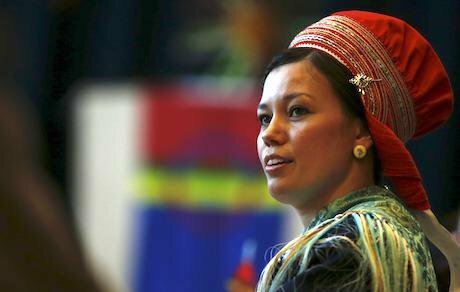 A woman dressed in traditional Norwegian Sami attire in Alta, northern Norway, on Sami people national day on February 6 2016. Credit: Alastair Grant/AP/Press Association Images. All rights reserved. Over the next two weeks, these three concerns will be discussed as agenda items at the United Nations’ annual gathering. And yet, indigenous peoples, who suffer at disproportionately high rates from these issue, will not be invited to participate in the meetings, nor any other general assembly sessions. There are more than 400 million indigenous peoples globally, belonging to 5,000 distinct tribes. This accounts for five percent of the world’s population, and unjustifiably 15 percent of the world’s poorest. Despite this, indigenous peoples do not have a seat at General Assembly sessions, and are therefore unable to participate in meetings that have a massive impact on their lives. This may not be the case for long. Last year, President of the General Assembly Mogens Lykketoft appointed four advisers to resolve the exclusion of indigenous peoples from the UN. Unpaid, they spent the last seven months compiling 16 pages of recommendations to be presented at the upcoming session. And yet, as an flood of diplomats arrives in preparation for this three-month event, the indigenous advisers remain in their homes, halfway across the world. “The work is finished in regards to the compilation of recommendations,” one of the four advisers, Claire Winfield Ngamihi Charters, told me. Charters belongs to Māori indigenous groups of New Zealand and is an Associate Professor at the University of Auckland. She explained: “We can’t really do anything until we are reappointed by the new president of the general assembly.” She does not expect to receive an invitation to the session until at least December. The advisers collected a list of recommendations during the spring of 2016, through both electronic and face-to-face consultations. At a bare minimum, they suggest enhanced participation in UN bodies that affect these populations. This includes a suggestion to create a separate category for indigenous peoples in the assembly, which would allow these groups to participate without defining themselves as member-states. The final draft of the recommendations was published in July, and includes the stipulation that this report will form the basis for a text to be adopted by the General Assembly in the fall. Despite this, the calendar of the 71st session is noticeably void of any meetings regarding indigenous participation, or any uniquely indigenous items at all. The advisers are not permitted to present their findings without formal invitation from the next president of the General Assembly, who is yet to be appointed. “We certainly hope that the new president will reappoint the previous’ team of advisers, in order to secure a smooth continuation of the process,” Henriksen told me. Charters voiced a similar sentiment. “It was all done very quickly, and I think it’s flawed as a result,” she told me. Appointed in February, Charters and the other advisers published their final draft only five months later. Defining which indigenous groups can participate means defining which indigenous groups can not. Other recommendations in the report read similarly; proposing an idea but also affirming that said idea does not generate a consensus among those consulted. Dorough is apprehensive of the potential creation of a separate category of indigenous participation in the General Assembly. Defining which indigenous groups can participate means defining which indigenous groups can not. Given that indigenous peoples worldwide belong to more than 5,000 distinct tribes, each tribe could not feasibly have their own presentation in the General Assembly, which currently consists of 193 member states. Representation would therefore need to be narrowed down. Defining who gets to have this representation, according to Dorough, could be a dangerous undertaking. A possible option, would be to select one delegate to represent all indigenous peoples across a given geopolitical area, for example, North America. In the United States alone, however, there are more than 2.9 million Native Americans, belonging to 562 federally recognised tribes. “For indigenous peoples in all of their diversity to distill themselves down to seven geopolitical regions and one representative from each, it’s a bit unfair,” Dorough told me. The case for how to enhance indigenous participation is far from closed. Although Dorough has reservations against the implications of the report, she still states that the question of indigenous participation needs to be resolved. “Frankly, I don’t know what the answer is, as far as a place for indigenous peoples within the General Assembly. But I really do fear a creation of different classes of indigenous peoples,” she said. The short timeline given to create the report, combined with the varying concerns about what indigenous participation would look like, lends to a report that does not come to any firm conclusions. Whether the recommendations are given any light at the upcoming session, remains to be seen. What is clear however, is that there is plea to increase indigenous peoples’ voices in UN mechanisms, especially given the overwhelming number of agenda items that intersect with indigenous issues. The case for how to enhance indigenous participation, however, is far from closed.